The tomb of the official Menekhibnekau is the third structure of its kind explored in the group of large shaft tombs from mid 1st century BC in the southwestern part of the ancient Egyptian cemetery at Abusir. The tomb lies about 40 m to the southeast of the tomb complex of priest Iufaa, whose intact burial chamber was discovered in the year 1996. 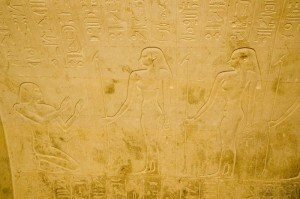 The exploration of the tomb of Menekhibnekau began in the year 2003 by uncovering its superstructure, largely destroyed by later stone robbers. In 2004 the major part of the main shaft was cleared and simultaneously also the south access shaft and underground cache with vessels and other materials used in the course of mummification and burial, which lies at the southwestern corner of the enclosure. 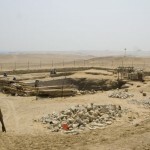 The hitherto latest stage of the exploration of the tomb was conducted in the spring of 2007, when the burial chamber itself was uncovered and opened. The superstructure of the tomb consisted of an enclosure of well-worked limestone blocks forming a square with a side measuring approximately 25 m. The walls of the superstructure were originally decorated with beautiful reliefs, but only a few hundred larger and smaller fragments have been preserved due to the activities of stone robbers, and even these are largely destroyed by weathering and salination. The original appearance and height of the superstructure can thus only be estimated. The substructure of the tomb consisted of a gigantic main shaft measuring about 13 x 13 m, at the bottom of which, about 15 meters deep, the massive burial chamber was constructed. The burial chamber was rectangular on the outside, but vaulted inside. The access to the bottom of the main shaft led, like in the case of the tomb of Iufaa, through two smaller shafts. From the southern one, a horizontal passage leads directly to the entrance to the burial chamber. The burial chamber is almost entirely filled by a double sarcophagus. The outer one is rectangular with a beveled lid and was made of two limestone blocks. The inner sarcophagus is anthropoid and made of dark greywacke. Both sarcophagi are almost entirely covered by texts cut in relief. The walls and ceiling of the burial chamber also bear rich relief decoration. The ceiling contains, besides a litany to the sun, a depiction of the daily and nightly journey of the sun, and below there are two files of standing female figures representing the hours of day and night (twelve each) – the hours of day are represented on the eastern side, those of night on the western side. The decoration of the front walls consists of passages from the Book of the Dead accompanied by illustrations – Chapter 148 to the north, Chapter 144 to the south. More chapters from the Book of the Dead, but also other collections of religious texts (the Pyramid Texts and the Coffin Texts) cover the side walls of the chamber and sarcophagi. 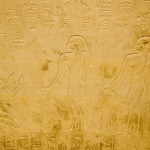 The main texts on the western wall of the chamber contains a long offering formula containing the fullest list of title of the tomb owner Menekhibnekau, but also the name of his father Gemnefherbak. The name of his mother, Sathathor, appears on the sarcophagus. 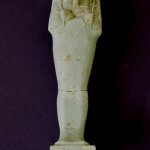 Judging from the preserved titles, Menekhibnekau belonged to the elite of the Egyptian society of his time. Besides the full sequence of titles that marked merely his position (corresponding very approximately to the titles of nobility known from later history), he bore the titles of general, commander of the Libyan troops, member of the personal guard of the king, admiral of the fleet as well as other less important official and priestly functions. Altogether he bore over twenty titles, even more than his probably much better known contemporary Wedjahorresnet, buried also at Abusir and ill-famous as “quisling”, working for the Persian conquerors of Egypt. Like Wedjahorresnet, also Menekhibnekau had been known from other sources – his statues are kept in the museums of Nantes and Berlin. The burial chamber was discovered looted. Tomb robbers, who penetrated the tomb in Late Antiquity (perhaps even twice), broke both sarcophagi and tore the mummy of the tomb owner, of which only the remains of several bones remain. Of the remains of the burial equipment, discovered scattered around the sarcophagus and outside the burial chamber, those worth mentioning include ushabtis, small stone and faience amulets, faience vessels for sacred oils and ointments, the so-called magical bricks inscribed with protective spells, fragments of vessels, etc. Of unique character is a small faience sealing with the depiction of a reclining jackal and nine bound captives, which probably served as the official seal of the necropolis, and also the elongated faience pendant (so-called menit) with the name of the last-but-one king of the 26th Dynasty Amasis, who ruled in the years 570–526 BC. 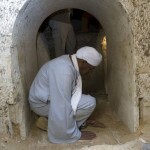 The exploration of the tomb of Menekhibnekau should continue in the year 2008.